Bengali New Year, which is popularly known as ‘Poila Baishakh’, is the first day of Bengali calendar. One of the most prominent festivals of the Bengalis, Bengali New Year is celebrated with much fervor and enthusiasm in whole of West Bengal and Bangladesh. This festival is celebrated in different parts of India and other countries as well by the Bengali community. Apart from wearing new clothes, offering prayers to God, feasting and merry making, exchanging gifts hold a major significance during this festival. If you are wondering when is Bengali New Year in 2012 then it is on 14th April. You can send gifts to India on Poila Baishakh with the help of a leading online e-gifting portal, GiftstoIndia24x7.com. GiftstoIndia24x7.com offers a plethora of amazing gifts on the festival of Bengali New Year. If you are located outside India, you can send Bengali New Year gifts to your loved ones back in India through our website. The varied gifts available in this top e-gifting portal ranges from sweets to home decor, chocolates, gift hampers, gift vouchers and many more. The gift available in our website are offered by some of the most reputed brands, like Shoppers Stop, Adidas, Mainland China, Pizza Hut and many more. The best among these is perhaps the dinner vouchers of world renowned Taj Group of Hotels. We are proud to offer you as many as 140 hampers on Poila Baishakh. Each of our hampers have a combination of beautiful gifts which will surely make the recipients very happy. You can opt for ‘Sweet Fragrance’ which is a combination of perfume and heart-shaped soft toy which you can send as gifts on Bengali New Year 2012. While sending mouthwatering chocolates on Bengali New Year gifts to India from our website, you can add dry fruits as well. The dry fruits are offered in beautifully decorated baskets and trays. In the section of Home Decor, you can choose from attractive looking flower vases, show pieces, wall hangings, photo frames and the like. In addition to these, gifts to India on Bengali New Year are categorised into Gifts for Him, Gifts for Her and Gifts for Kids. In Gifts for Him, you will get to choose from Cufflink Sets, Electronics, Flowers, Men’s Wear and more. In the category of Gifts for Her, you can choose from Cosmetics, Flowers, Sarees, Show Pieces and the like. When you are choosing gifts for your little angels on Bengali New Year from Gifts for Kids, do check out the section of Soft Toys. Our category of Soft Toys are divided into Exclusive Teddies, Soft Animals, Love Hearts and Soft Cushions. In addition to these, you can send Bengali New Year gifts to India to infants from the section, New Born Gifts. Starting from baby care products to gift sets, gift hampers, soft toys and many more are offered in this category. All the products available in this category are offered by brands of international repute. 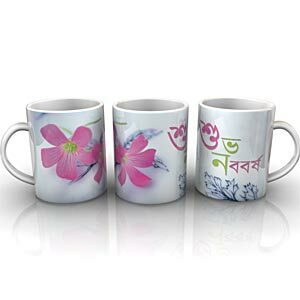 Unique to our site, for the Bengali New Year, we are offering to your an exclusive range of ‘Poila Baishakh Mugs’. The beautiful looking mugs come with ‘Happy New Year’ written in Bengali on it. You can go for these unique gifts and send on Bengali New Year to India to your dear ones and make them happy. Since the mugs are priced at affordable rates, these are must buys for the festival. GiftstoIndia24x7.com is one of the leading e-gifting portals that helps you to send gifts to India on various festivals and occasion. If you want to make Bengali New Year celebration memorable for your loved ones back in India, you can send gift to India from our website.